We're recapping Wild Card Weekend and looking forward toward the Divisional Round. I'll remind you that I was 2-2 in my picks this weekend, and if I hadn't been sucked into the trap that was Chad Pennington playing mistake free football, I'd have finished 3-1. 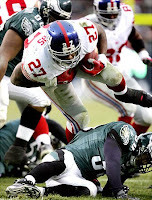 Money Pick Of The Week: New York Giants -4 People, the Giants are playing in The Meadowlands against Donovan McNabb and Andy Reid. Please.